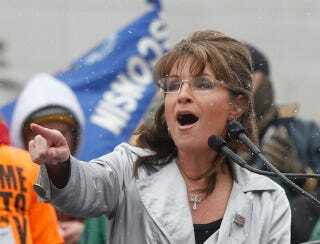 Sarah Palin Wants The GOP To "Fight Like A Girl"
In Wisconsin, Sarah Palin cited the Badger women's hockey team: "Maybe I should ask them if we should be suggesting to GOP leaders they need to learn how to fight like a girl!" Cue a Fox News morning host's interpretation of what that is: "They gossip, they do it behind your back. Just kidding, ladies!"